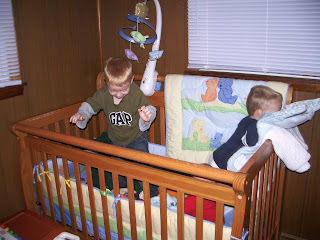 Shane and I walked in the boys' room the other night, to find them "playing" with Ethan. This actually turned out to be a game of "climb up the toy box to get high enough to hurl ourselves over into Ethan's crib and then practically smush him." If you can't tell in the picture, Ethan is in red, and that is Colin's gray sleeve/green shirt. He had his arm wrapped around Ethan's neck and his head was actually under Ethan's. It was quite a sight. Cameron was in mid-climb, going back out of the crib only to turn around to come back again. But they were really enjoying themselves. See Colin in the second picture? Shane actually caught him in mid-dive. 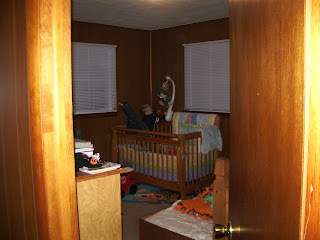 If you look really hard, you can see his legs sticking out of the crib. 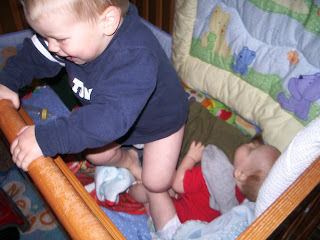 Yet one more instance they gave mommy and daddy a good laugh!